Last weekend I had the privilege of attending a 3-day class centered on the book “When We Are Free,” by Timothy G. Nash, Dale C Matcheck, Evgeniy I. Gentchev, Alexander Watts. My professor was Kent Snyder, who in addition to teaching at Northwood is a financial advisor in Troy, MI. I am attending Northwood University in pursuit of my BBA and this May I will be graduating with my associates. After 10 papers, we had to write an overview of this book. Since I took the time to write it, I thought I would share it with my visitors. This is not exactly the most fascinating of reads, but if you are interested in freedom, capitalism, free enterprise, and the role of government in it all, reading this book will indeed open your eyes to the twisted ways in which our government has misrepresented the Constitution of the United States. With government bailouts, welfare, and stimulus packages, our government is not getting smaller, it’s increasing in magnitude. I thought I had a grasp of what freedom was and how it related to how we conduct business, after reading When We Are Free I realized I had a lot to learn…and still do! We hear them all the time; terms like free enterprise, capitalism, limited government, socialism, etc. But, when asked to define these terms and relate them to today’s current affairs I admit I would have been hard-pressed. That is of course is prior to having read the book, When We Are Free. At first glance I thought When We Are Free to be just a collection of essays that would prompt discussion about issues related to the market, but after having read the entire book I find it to be more of a creed by which those that enjoy freedom could further enhance and appreciate what “true” freedom, as it relates to the market could mean. Every-day things we take for granted; full shelves at the local Wal-Mart, interstate and global commerce, supply and demand, currency value, market fluctuations and trends, if left uninhibited by government have proven to be more effective than government policy, legislation, or regulation. When government seeks to overstep its Constitutional boundaries, as it so often is willing to do, the market is adversely affected as has been demonstrated throughout history. When has the government gone too far, one might ask? How should the government be involved in the market, in our businesses, in our economy? Should the government be involved at all? Our forefathers had the exceptional ability and foresight into the common pitfalls of government and to address those pitfalls through our country’s Constitution. This document is not simply a commentary on how things should be, but rather a contract that every democratically elected public servant vows to uphold. One of the stories that told of a member of congress who misrepresented the Constitution, and was confronted, can be found in Chapter 34, Not Yours to Give by Edward S. Ellis. Col. Davey Crockett was campaigning along the countryside and was challenged by one of his constituents as having overstepped his Constitutional obligation. In awarding taxpayers’ money to aid those that had lost their homes in a fire, Davey Crockett had violated an article of the American Constitution. Despite the best of intentions, as may well be the case in our modern day, by giving away what is “not theirs to give,” Congress is in direct violation of the Constitution. Congress is not at liberty to provide charitable contributions regardless of circumstance. America has been blessed with thousands of non-profit organizations, philanthropists, and other charitable foundations that can and will come to the aid of those in need. By usurping congressional authority in this area, congress has effectively violated the trust of the American people, and indirectly has stated they know what is better for us than we even know for ourselves. Some would argue, “Where is your compassion? How could you in all fairness turn people away knowing full-well they were in need of your assistance?” When vowing to uphold the Constitution of the United States, taking liberties as to its interpretation has not been granted to a member of Congress. By overstepping the Constitutional boundaries, they have violated what they have vowed to uphold, and by so doing they trample underfoot the very document that enabled them freedom to run for office and be elected in the first place. A little ironic is it not – holding true to one aspect of the Constitution, but ignoring the other? In an act of true humility and meekness, Col. Davey Crockett publically admitted he had misrepresented the Constitution and would from that moment do all within his power to correct his error, and never again make that mistake. That is true integrity and willingness to set aside one’s pride and ego in true deference to the Constitution, and the American people who elected him. So, a true understanding of the Constitution of the United States, and an adherence to what it says about our government are essential to fully embrace and appreciate the freedoms it guarantees. 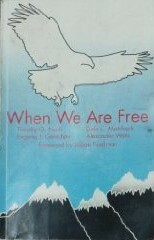 When We Are Free is centered on capitalism. As it is described in this book, capitalism is a theory of economics that is not without its criticisms. Some assert that capitalism is rooted in greed, self-interest, and waste. In the chapter entitled, Nine Lies About Capitalism by Madison Pirie, I found the best evidence to support capitalism than anywhere else in the book. Lie, by lie, Pirie combats each with truth, truly dispelling commonly held myths about capitalism. Those that take a seemingly pious view of capitalism and claim it is immoral, according to the author, fail to see how capitalism actually encourages us to put the needs of others above our own. Granted, we are expecting compensation when that need is met, but if we are not sensitive enough to meet that need, or if the incentive were not there (due to capitalism), neither we nor our neighbor benefit. Capitalism is truly the fairest way for both parties to be equally benefitted. Time would escape each myth to be dispelled, but suffice it to say, capitalism versus any other type of economic environment does the best job of creating a fair and balanced playing field for those that wish to invest the time, energy, and capital to improve their lives, and the lives of others. Overall, When We are Free is an excellent perspective on our government and its role (or lack thereof) in our economy as it pertains to a free enterprise market system. Milton Friedman describes the role of government as follows: to preserve law and order, protect the nation against foreign entities, to establish laws and a framework of rules by which to conduct business, to enforce contracts that have been entered into voluntarily, to provide judiciary to settle disputes, to provide a monetary system, and lastly a “paternalistic role” that would aid people in desperate need of assistance. Sadly, as Friedman points out, the government has expanded its activities in areas not intended by our forefathers, and it is in these areas they are performing so poorly that they are doing more harm than good. It is my opinion that rather than stimulate our economy, they stifle it. Rather than helping the people who need it, they enable the wrong people causing them to become dependent. Rather than shrinking and limiting their size, they are expanding. And, rather than doing a service to our great Nation, they do a disservice if they fail to uphold the Constitution of the United States. I am certainly going to recommend When We Are Free to those that have a genuine interest in either capitalism or government. This will undoubtedly shed new insight into the roles of each.